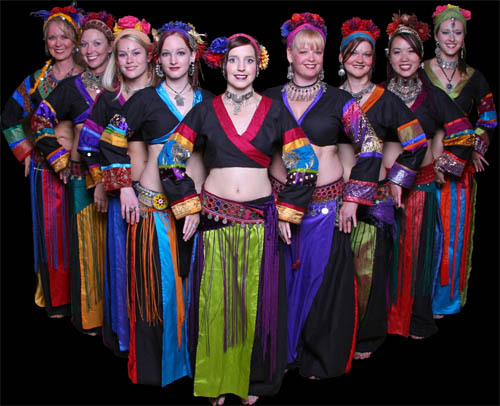 Nomaditude is a student tribal belly dance troupe under the direction of Sharon Moore. With a strong focus on our own individual developement as well as supporting one another, Nomaditude loves to entertain audiences while we grow as tribal belly dancers and performers. Tribal belly dance is a powerful and fun way to express yourself, and share in something truly uplifting with other women. You, too, can learn this exhillarating dance form! Whether you ever wish to perform or simply want a new form of exercise or social activity in a supportive and positive environment, you will find a home in Sharon Moore's tribal belly dance classes. Classes are taught weekly in the Seattle area, and participants range in age from 13 to 70, from zaftig to lithe, from athletic to striving to be more active, everyone is welcome and encouraged to join us. In class we not only learn to move in new ways, but enjoy the company of one another, support one another, laugh a lot, and learn to love our bodies for their individual forms of beauty and strength. Click around on the links to the left to learn more about Nomaditude - Tribal Bellydance with Attitude: who we are, what we do, and where to catch us next!